Meet Vanessa Cooney from Embracing Life Ceremonies. Vanessa is an Independent Celebrant with the UK Society of Celebrants. A Family or Wedding Celebrant is a Celebrant that can write and deliver Wedding/Civil Partnership Ceremonies, Renewal of Vows Ceremonies, Naming Ceremonies or other Life Event Ceremonies that are conventionally accepted as being joyous & happy in nature. Once you have arranged your notification appointment, the HSE will issue you with an MRF (Marriage Registration Form) or documentation for Civil Partnership. This document will then be passed onto an HSE registered solemniser, who will witness the signing of this document so if you are marrying / civil partnership at a Registry office, this signing will take place there. If you choose to have Vanessa host your ceremony, couples need to arrange for the Registrar (the HSE) to hold onto the MRF/Partnership documentation, and at the second arranged meeting with them, you (along with your two witnesses) would sign the document in the presence of the HSE Registrar, this means that you would need to arrange two appointments with the HSE – first, to give Notification, then later a second appointment to sign your legal documents. 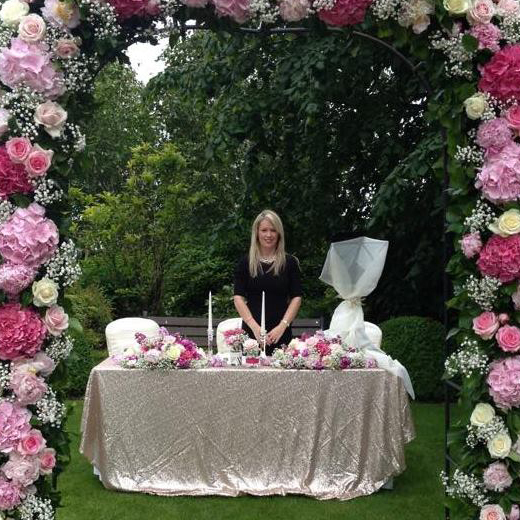 So, why choose a Wedding Celebrant like Vanessa? If you cannot arrange for a registrar to be present on the day of the ceremony as the date is not available, or if on a legal basis, the location cannot be used ‘officially’. If you would like a more personal ceremony, written and designed together with your celebrant, from scratch – unique to you as a couple. Vanessa has many years of experience, understanding and extensive resources and knowledge of the wedding industry, and of course she has ‘the know how’ and skill to create a very special memorable ceremony for the most wonderful and important day of your lives. I am here to support and work together with you to include your ideas, beliefs and way of life, guiding you with my extensive experience and expertise to make your personal ceremony unique, intimate and unforgettable”.